6-7(4), 7-5 in San Jose. 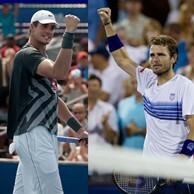 Yesterday, John Isner defeated Kevin Anderson in three sets to advance, while Mardy Fish ousted good friend and No. 1 seed, Andy Roddick 7-6(5), 6-3. The doubles final is also set and will be played at 12:30 p.m. when Americans Scott Lipsky and Rajeev Ram take the court against Rohan Bopanna of India and Kristof Vliegen of Belgium.